4.45am, May 6th- Ring! Ring! The alarm shrieks its banshee wail of urgency. Down in deepest Dorset nothing stirs except in the Pett household, as John and Penny get ready for the big day. 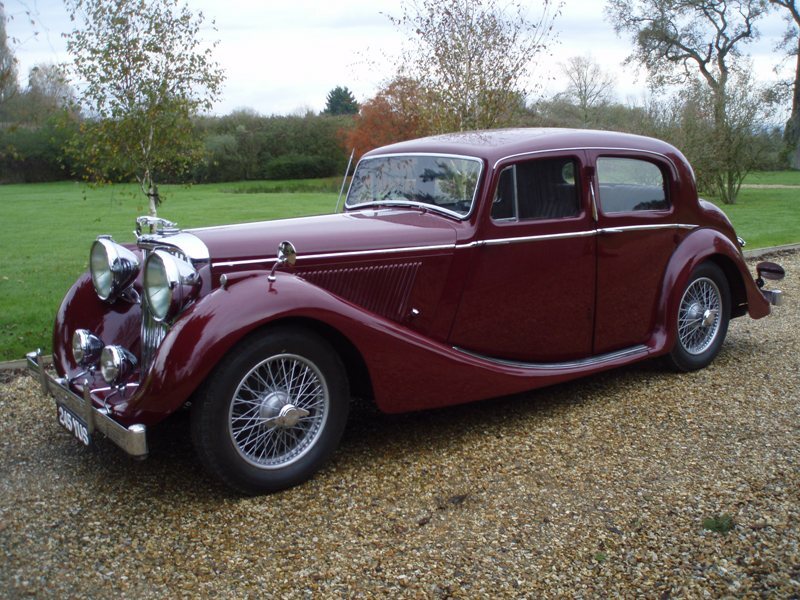 After a quick breakfast for the humans , “YUS”- the 1948 Jaguar 3-5 Litre Saloon “Mark IV”- is awoken for its longest journey to date – 115 miles to Windsor Castle for the “Great Day Out” and return in one day. The name YUS was given to the car as its number plate was 245 YUS. Fortunately the weather is clement, but the M3 is partly closed and Thruxton is having a racing day- so heavy traffic could be expected. The dawn chorus is starting up as the engine roars into life and we leave just before 5.30 am. On the road good progress is made – at a steady 50 mph – and Thruxton is passed without any significant hold-ups and the Reading turning at Basingstoke is achieved. Soon onto the M4 and the A339 is reached. It is 8.00am and we find ourselves lost in Windsor-but close to the Castle. Two other beautiful Parade Jaguars go past in the other direction: these are quickly flagged down and we turn round and follow them to the Long Walk. Unfortunately this is peak hour at the Long Walk as the security is tight and inspection thorough. This stop/start procedure is not kind to the older cars, but we finally make it to our parking place, directed by the efficient marshalls, to the “oldies” area. Having parked, the bonnet was opened to allow the engine to cool down after the long journey and before the Parade which was now in about 90 minutes time. On looking at the carburettors, it was evident that the automatic choke in between them was somehow loose and missing a retaining spring! It had obviously come off just as we parked. On attempting to restart the engine, petrol vapour poured out of the choke and we felt that our trip to Windsor Park had come to an end and we would not make the Parade- and that the tow truck would be called. It was at this point that those Jaguar stalwarts Brian Gibbins and David Chappell from their 1933 SS1 came over to see what was going on. On inspection they asked if I had a piece of wood! I replied that I did not, wondering if these gentlemen were on the same planet as myself. David then went over to the Royal hedge and removed an 8 inch long by half inch diameter twig and brought it back. 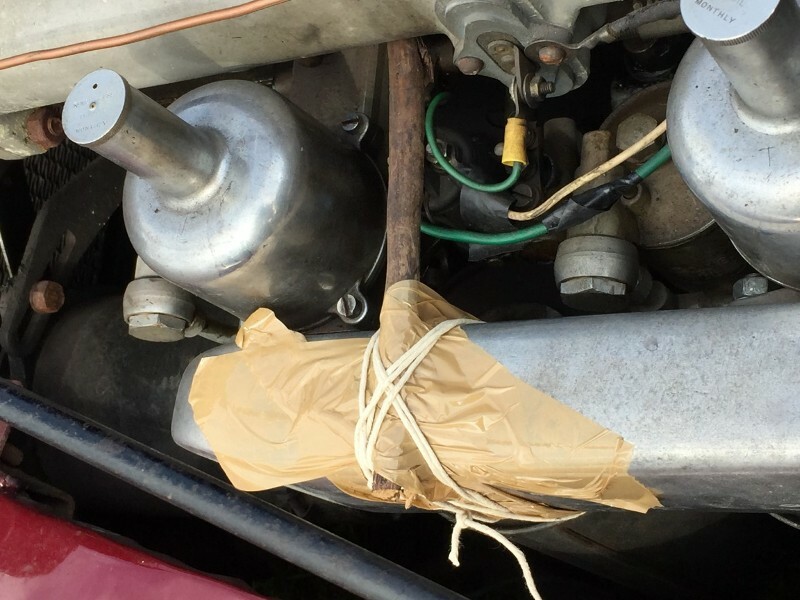 Asking me for masking tape and string, which I did have, they proceeded in 5 minutes to repair the choke by putting the twig across the choke and binding the twig appropriately – see photo – which held the choke tightly in place. The choke was now sealed and the petrol could continue to flow. I fired up the engine and presto! No problem. With ten minutes to go before the Parade we seemed to be well placed. The hope was that the twig would hold in place. We read the instructions closely as to what to do if one broke down during the Parade (very thoughtful and comforting!) and set off as car no 11. Following the memorable Parade through the Quadrangle we returned unscathed back to our parking place with much jubilation and thanks to Brian and David. After the Parade had finished Prince Edward came round to look at the cars and on seeing YUS came over and I lifted the bonnet to show him the emergency repair with part of his Royal Garden. He was much amused and commented that you could not do that with a modern car! At 4 o’clock we set course to Marnhull, in Dorset, for the 115 mile return. The repair worked perfectly and we arrived at 7.30pm. It had been a very tiring, but thoroughly enjoyable and memorable day – made possible by Brian and David – for which again many thanks. Also a great thank you to the organisers for the event which seemed, to the entrants at least, to go very smoothly. When we got home some friends rang to say we had been on Sky News at 7pm with Prince Edward looking under the bonnet at the repair. For the three of us, Penny, myself and YUS, it was our five seconds of fame and evidence of our attendance! 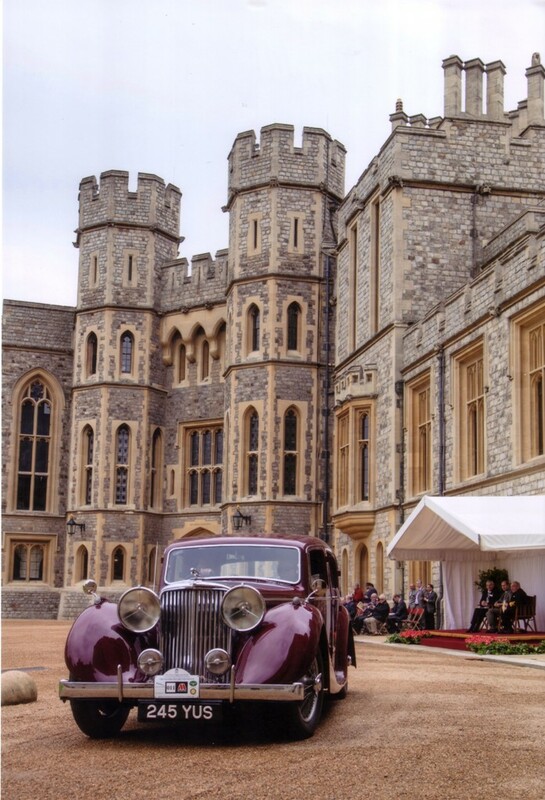 Brucie’s Diary: May 2017 – Royal Windsor Jaguar Festival, through the eyes of Letitia Mace, along with the history of how this unique event came about.